You are a father now! Don't you think it's time to get out of the racket? ...into that fake Brooklyn motherf*cker in the picture above. What in the hell is this dude doing sneaking into my house and eating my hamburgers? Whoever designed the new Hamburglar's costume chose a super unsettling mix of kitsch, cartoon and mass-produced polyester hipster. 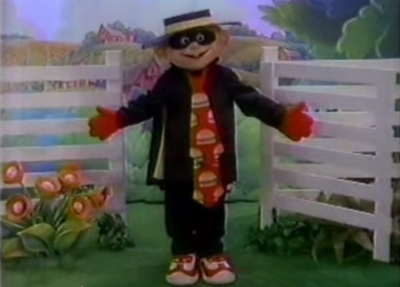 If Hamburglar is going to wear a tailored trench coat and stylish striped long-sleeve blouse, he does not need to also wear a clip art-meets-Pharrell top hat. Nor was he under any obligation to put on that hideous meat tie or fake leather gloves. It is clearly not cold enough for gloves, and we know this because he is wearing a trench coat. Hamburglar, are you a real criminal or a college guy who forgot that it was Halloween but wanted to be festive anyway? Do you think if you walked into a bank or a hamburger restaurant that they would somehow not see you? Or that that ridiculous hat would fail to immediately betray your identity on every single security camera you walk past? Rabble, rabble? For Christ's sake.